Arguably Shakespeare's finest tragedy, this love story between two star-crossed lovers from warring families is as timeless as the angst and beauty of young love. Unlike the original play, and subsequent versions of a story oft-told, this unique take on Romeo and Juliet has been cleverly corralled and tenderly told through the eyes of young Juliet Capulet, our 13-year-old protagonist. 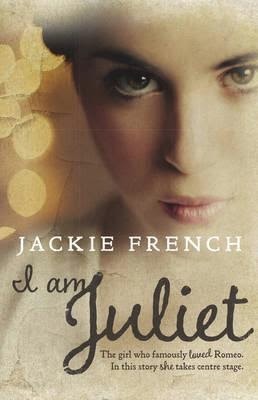 As Jackie French does so well, I Am Juliet quickly propels the reader into a time long past. Starting the book with a peek into Shakespeare's world, we meet young Rob, a teen lad who is the first to play the role of Juliet on an Elizabethan stage. We soon after shift to Juliet, and, save the last chapter, the entire saga is told through the fresh, young eyes of this confused yet determined girl, whose unexpected love for her family's enemy propels her into a world of danger--both in the real world and within the confines of her own heart and mind. Nurse, the Joans, Juliet's parents, Tybalt and our other familiar players, perform their roles with gusto through Juliet's gaze. We feast with her. We bathe with her. We dress with her in gowns of yore. We feel her shock and awe at her lightning-strike passion, and we pine and fear for her as she manipulates her most closeted world, in an attempt to unite forever with her one true love. The tenderness and beauty French injects into the text is mesmerising, and will both enchant young readers and send older readers back to the loves of their own past, when the heart is at its most vulnerable. Evocative scenes, tangible smells and sounds combine to immerse the reader in a carefully-designed plot that both stays true to the classic play, and also uncomplicates things for the younger reader. The final death scene with Juliet is astonishingly descriptive--both raw and confronting, and absolutely showcases the author's consummate skill with words. Juliet, despite her tragic ending, is a wonderful role model for young girls, intent on remaining true to themselves and following their hearts. Although her eventual choices were clouded by the youth that lead her to peril, the underlying message of strength and self-reliance is as golden today as it was 500 years ago. French provides fascinating author notes at the end of the book, including extra information and thoughts on Shakespeare's work and Elizabethan England. The book is marketed at 10+ readers, but mild sexual references and descriptive death scenes warrant a 12+ audience (perhaps slightly younger for more mature readers, with parental guidance).